Cincinnati's Krohn Conservatory is one of the jewels of the Cincinnati Park system and boasts more than 3,500 plant species from around the world within its four separate greenhouse exhibits - Fern House, Palm House, Desert House and Show House. A local landmark, the conservatory is located in Eden Park and was built in 1933 during the Art Deco era. 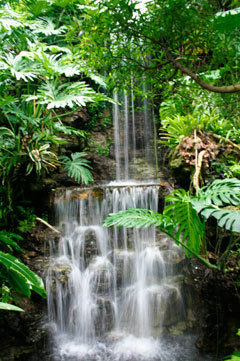 It serves as a destination for naturalists visiting Cincinnati and is a popular tourist attraction throughout the year. The Conservatory also plays host to a number of marquee events throughout the year such as the springtime Butterfly Show and the live nativity scene erected each holiday season. After 75 years of service though, Park Board officials say that major renovations are needed to keep the Conservatory in working order. The renovation work will take over a month, cost approximately $200,000 and force the Conservatory to close during that time. The impetus to move ahead with such major renovation work at this time was the collapse of the sewer system in front of the Krohn Conservatory. As a result, the facility will be closed from July 20 through August 28, with a re-opening celebration planned for Saturday, August 29. According to Park Board officials, the renovation work will rebuild the floor of the Show House, rebuild the three exit doors of the building to original design specifications, repair the collapsed drainage system that was originally installed in 1933, and will install a new catwalk in the Fern Room to allow for maintenance to the new mist watering system that was installed at the beginning of this year. Officials note that while the renovation work takes place, the surrounding gardens that follow the theme of historic victory gardens with edible plants will remain open to the public. The free wireless internet at Krohn will also remain in service so that visitors may continue to access the internet while visiting the facility. Park Board officials also note that the fall floral show, "Backyard Birds & Wildlife," will commence on Saturday, September 12 and continue through November 1 with the other fall programs and events. Those looking for additional information are instructed to contact Andrea Schepmann at (513) 421-5707.